LONDON, England (CNN) -- It's not every day the average Joe gets to take a peek at the personal possessions of a royal. 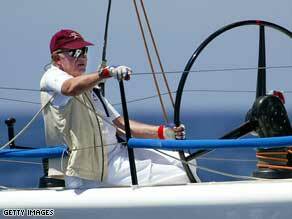 But, this month CNN's MainSail program has been lucky enough to go on board Juan Carlos I -- the King of Spain's racing yacht. We get a unique insight into just what a royal's boat looks like and the kinds of technological toys and state-of-the-art equipment a King likes to equip it with. Speaking with the one of the boat's crew members, Ignacio Triay, CNN MainSail presenter Shirley Robertson finds that the King's boat is, indeed, at the cutting edge of modern sailing. The 52ft vessel is raced by a crew of 15 people and has competed in some of the world's most popular yacht racing series, racing alongside the very cream of the world's sailing talent. Triay, who has been sailing for the King of Spain for over 20 years, said the boat contains all of the best modern electronic and sailing equipment. For more sailing features -- including the 10 weirdest sailing terms you'll ever hear -- visit the MainSail homepage.